"I've had this muesli every time my family and I went to Harrison Hot Springs in Canada. They served it at the breakfast buffet. I could never get a recipe but I think it's pretty close to the real thing! It's different but very good! I recommend making this the night before to have in the morning - a very fast, easy breakfast." 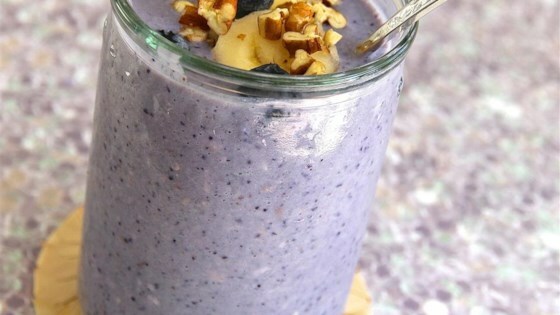 Blend 1 cup soy milk with blueberries in a blender until the mixture has the consistency of a smoothie, about 1 minute. Stir together the oats, coconut, and pecans in a large bowl. Stir in the blueberry mixture, yogurt, and the remaining soy milk. Cover; refrigerate for at least 4 hours or up to overnight. A delicious homemade breakfast cereal with dried fruit, nuts, oats, and bran. Top with bananas, dried fruit, or other fresh fruit. This was like yogurt porridge. I feel like I wasted my ingredients. I could see how some people may possible like it, so I wouldn't give it 1-star, but I don't think this is an impressive recipe.